Sora steps off the boat and walks onto the dock. Smiling I look around.I'm finally on my way, I'll make you proud Kuroi. Rain sits on my head and speaks out with excitement.Mudkip Mud! I look up at him and smile. I begin walking off the dock.Let's find out where we can get some more friends. I say trying to find a pokemon trainer who could give me my desired information. I finally spot someone who appears to be a trainer. 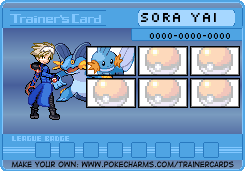 I approach them with a smile.Hello, I'm Sora Yai, I'm new around here...so, um do you mind telling me where i can go some pokemon? Rain noms on my head a little.Oh and this is Rain, he's my best friend. I say laughing. The man turns to me.Oh hello there, I'm Jack Surling and this is King.He say points his thumb behind his back to indicate that King id the NidoKing standing behind him.King crys out and snorts showing that he was proud of the name.As for pokemon you can go to Neverseen Forest just out side of town. Blinking i look at King.Um, Thank You...Do you mind showing me how to get there?I ask smiling excited to get there.Oh before i forget im looking for someone. There name is Kuroi Yai. I begin describing Kuroi to Jack. Jack said he saw someone come through here who matched the description. I smiled big in excitement.I'll catch up to you soon big brother. No problem and right this way. Jack turn and begins walking. He takes be to the entrance to Neverseen Forest.Here it is Neverseen Forest. Jack says turning to me.Thanks again for everything Jack. I'll be going now. Rain cries out a Thank You, as i walk into the Forest.